Limes are small, round, greenish-yellow, intensely acidic citrus fruits. Lime is primarily used for its juice in the western world, and for preparing "condiment-pickle" in many Southeast Asian countries. Botanically, lime fruit is a member citrus Rutaceae family fruits; a broad family which also includes lemon, orange, pomelo, tangerine, and grapefruit). Scientific name: Citrus aurantifolia. It is the smallest among citrus fruits; nevertheless, it holds more health-benefiting nutrient profile than other citrus counterparts like lemon, orange, etc. Lime is an evergreen, small tree. Its dark-green, glossy, thick leaves appear similar to lemons. Unlike lemons which prefer cool temperate climates, limes can flourish well under tropical, humid environments. In general, citrus trees can grow on a wide range of soil types ranging from sand to loam to heavy clay as long as they are well-drained. Generally, limes are smaller in size but more acidic than lemons. Their outer rind is green and glossy, bit thinner than lemons. The peel is turning to yellow at maturity. The pulp is light-green, with 6-15 segments, aromatic, juicy, and highly acidic arils. 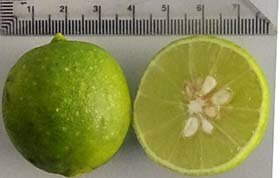 Each fruit measures about 1.5-2 inches across and weighs about 50 to 60 g.
Key lime-It is the predominant lime cultivar inside the USA. They are small in size, feature thinner peel, and more tart and juicy than other cultivar types. Persian lime is a hybrid between Key lime and citron. It has oblong shape and almost seedless. It is larger than other lime varieties and has thicker rind. Limes carry almost the same amount of calories as lemons; 30 cal/100 g. They are one of the very low glycemic index fruits. Lime juice contains citric acid, an organic acid which gives sour taste. Citric acid constitutes about 5 mg per oz of its juice. Citric acid is a natural preservative, antioxidant, helps dissolve kidney stones and helps in smooth digestion. Limes carry moderate concentrations of vitamin-C on comparison to other citrus ategory fruits like oragnge and lemon. 100 g of fresh fruit contains 29.1 mg or 48.5% of daily avarage intake. Vitamin C is a natural water-soluble anti-oxidant. It helps in the prevention and cureof scurvy disease. Besides, consumption of fruits rich in vitamin-C helps the human body develop resistance against infectious agents and scavenge harmful, pro-inflammatory free radicals from the human body. Limes and lemons compose flavonoid glycoside phytochemicals such as hesperetin, naringin, and naringenin. Naringenin is found to have a bioactive effect on human health as antioxidant, free radical scavenger, anti-inflammatory, and immune system modulator. This substance has also been shown to reduce oxidant injury to DNA in the cells in-vitro studies. Limes carry relatively more vitamin-A content than lemons. Vitamin-A is a natural antioxidant which helps in the mucosa and skin integrity as well as acuity of vision. Consumption of natural fruits rich in vitamin-A and carotenoids helps the body to protect from lung and oral cavity cancers. They compose modest amounts of B-complex vitamins such as niacin, thiamin, pantothenic acid, pyridoxine, and folates. These essential in the sense that body requires them from external sources to replenish. Further, they carry a modest amounts of minerals like iron, copper, potassium, and calcium. Potassium in an important component of cell and body fluids helps control heart rate and blood pressure. The outer peel of lime fruit composes aromatic essential oils. The oil is used in the food and pharmaceutical industry for its preservative, anti-viral and antioxidant properties. Citrus fruits have long been valued for their wholesome nutritious and antioxidant properties. Citrus fruits, especially lime, lemons and oranges, have many scientifically proven health benefits in terms of disease prevention; for example- urinary tract stones, arthritis and scurvy. Moreover, it is now beginning to be appreciated that the other biologically active, non-nutrient compounds in citrus fruits such as phytochemical antioxidants, and soluble as well as the insoluble dietary fiber is helpful in reduction in the risk for diabetes, cancers, obesity and coronary heart diseases. Key limes season in the USA is between May and August. Fresh sweet and Persian limes are available year-round in the fruit markets. While buying, look for well developed, fragrant-rich, heavier limes featuring fresh citrusy aroma that can be appreciated when you gently roll your finger over them. Avoid those with surface blotched, overtly soft fruits as they tend to perish early. Also avoid dry, shriveled; and hard, immature fruits as would not be as much juicier. Owing to their thin peel cover, limes tend to dry early when compare to other citrus fruits like oranges. Once at home, use well ripe fruits in the recipes and green limes in the refrigerator for 5-7 days. Cut lime sections spoil early if kept in the air. Wash and mop dry limes before use. Scrub thoroughly if intend to using zest. If juicing, cut the fruit in half using a paring knife. Lime squeezer are available in different made, and sizes for effective juicing without adding seeds and pith (pulp) in the recipes. Lime slices/wedges are used to garnish salads and dishes. Limeade is a very popular beverage. They can also used in confectionary such as pies, breads, tarts, cakes, pastry dough, and marinades. Key lime-pie is a popular American dessert, particularly in Southern states (Florida). The outermost part of the rind grated using a zester to produce lime-zest, which found application in marinades, desserts, etc, for its flavorful essential oil rich peel. Iced lime tea is a refreshing drink. Limes, in a way similar to lemons can be dried and preserved (black limes), which then employed as a condiment in the Omani and Persian cuisine. Lemon/lime pickles are favorite side dishes in the Middle-East, India, Pakistan, Morocco, etc. Lime juice is very acidic and has 1.8-2.0 pH. In some sensitive people, its sour, acidic juice may sometimes elicit burning sensation if come in contact with mouth, tongue, and lip ulcers. Also, if taken in large amounts, may exacerbate acid-peptic disease and stomach ulcer conditions. (Medical disclaimer). <<-You may also like to read- Lemon nutrition facts. <<-Back to Fruits from Limes nutrition. Visit here for an impressive list of all variety of fruits with complete illustrations of their nutrition facts and health benefits.